Microsoft started rolling out the Windows Phone 8.1 update in the middle of this year and it has already surpassed the 8.0 in market share, making it the leading version. WP8.1 powers nearly half of the market, while WP7.x still has 16.6%. And it's all Nokia phones – Microsoft Lumia from now on – with 95% market share. HTC is a very, very distant third with 3%, Samsung has 1%. Microsoft brags on occasion about signing up another WP partner but the trailing 10+ manufacturers have a pitiful 0.08% market share. The face of Windows Phone, the Lumia 520, declined 3.7 points but still maintains a massive lead over all other models at 26.9% share. Its replacement, the Lumia 530, is not on the map yet but with bargain basement prices it will climb quickly. The other entry-level Lumia, the 630, is growing fast and jumped over the 920 and currently holds third place. The Lumia 730 and 830 mid-rangers are still too new to be on the charts but the Lumia 930 flagship has been rattling around for a while now and it's still nowhere to be seen. 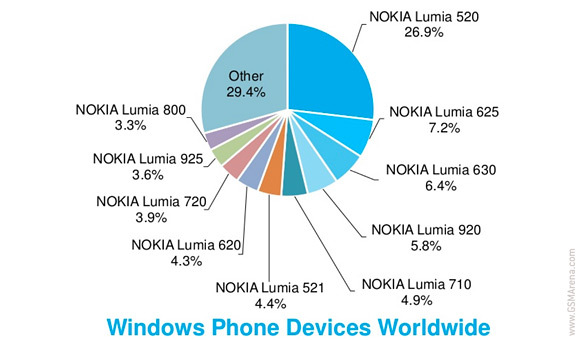 The Lumia 800, the first WP handset, still has 3.3% and still holds 10th place. In the US T-Mobile's Lumia 521 is in first place with the Lumia 520 in second. Even so AT&T has just over 30% of the US market, while T-Mobile has 20%. Throughout other markets the picture is much the same – most people have Lumia 520 and other entry-level devices, with plenty of WP7.x generation devices still in use. THAT fragmentation... Where are the guys saying WP has no fragmentation?